We have many high achievers at Oil Search who continue to strive for success through a variety of pathways. Being responsible for an entire gas production facility with high value assets can be no easy job but for Wendy, it’s in her DNA. As a fully trained Oil Search process technician, Wendy is now the company’s first female Production Supervisor, and maybe even the country’s. A trained process technician at an oil and gas facility is expected to minimise equipment downtime in order to maximise production and do so safely – a highly critical role no doubt. 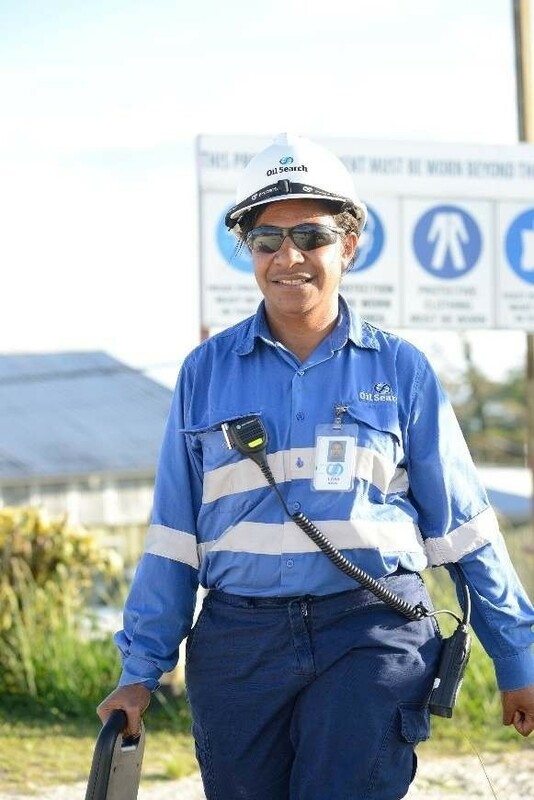 You must meet expectations or you exceed them and for Lydia, Oil Search and PNG’s pioneering female process technician, it also means breaking new ground and creating a pathway for others. 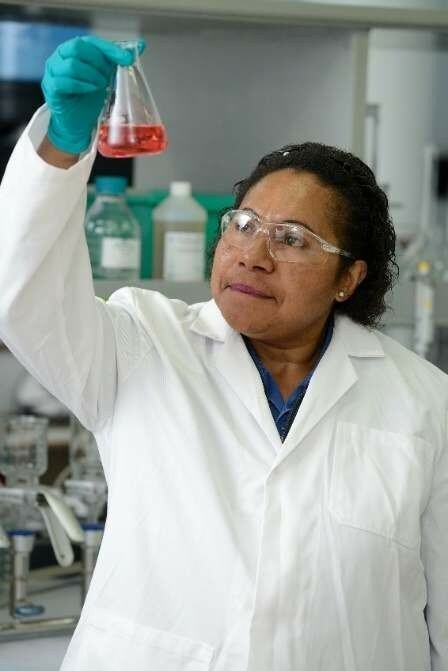 Meet Grace, a Chemist at the Oil Search Petroleum Laboratory in Kutubu, Southern Highlands. She tests and certifies Jet A-1 fuel according to ASTM International Standards, the recognised international Test Methods for Aviation Turbine Fuels. A passion for exploring the unknown, Julianne channels her inquisitive nature to analyse geological and geophysical data gathered in the field to help map out the unchartered territory - the history of a basin and where oil and gas may be found. 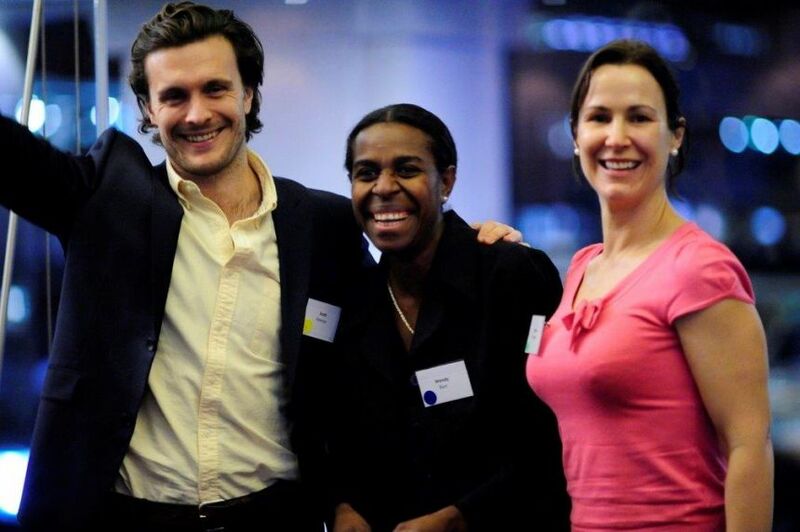 Chelsea (pictured - right) is part of Oil Search's senior management team, as Group Treasurer, having worked with the Company since 2012. Wendy ensures day to day operations of our Hides maintenance and production team under her care is executed safely and effectively. “And it’s not because I am a woman that I have been trained to do certain things but it is because I am a woman that I can do all this and more,” she said. Apprenticeship Program and went on to participate in the Oil Search Accelerated Development Program and the Citizen Development Program (CDP). The CDP creates a pipeline of PNG leadership talent to meet the company’s current and future needs. With the support of her senior leaders, Wendy has undergone extensive on and off-the-job development in preparation for this role, including leadership coaching. She was one of the first two females to operate Oil Search’s Kutubu refinery where she helped supervise the processing of crude oil from an on-site storage tank into jet fuel, kerosene and diesel. Wendy admitted the journey was not easy. “I have come a long way since I first started as an apprentice process technician,” she said. “Oil Search did more for me than I could ever imagine. They believed in me and helped me realise I was paving the way for women in PNG when I became the first female refinery operator, control room operator, production trainer and now the first female production supervisor. Wendy is also one of many proud parents on a fly-in-fly-out (FIFO) work roster. Her advice to girls looking at technical fields is that you can achieve anything if you put your minds to it. “I would like to be an inspiring role model for all females venturing into technical fields that were once male- dominated”. The Hides gas field, located in PDL 1, was discovered in 1987. Gas from this field is used to supply the Hides Gas-to-Electricity Project, which commenced in 1991 and is operated by Oil Search. The Hides GTE Project consists of a pipeline connecting the Hides 1 and Hides 2 wells to a small gas conditioning plant at the Hides Production Facility located in the Tagari River valley. Sales gas is then used by the Porgera Joint Venture to generate electricity in an adjacent facility. The electricity is transmitted to the Porgera Gold Mine by overhead wire. Condensate produced with the gas is distilled into naphtha and diesel which is used within the Hides facility and sold into the local market, with the balance transported by truck to the ExxonMobil operated Hides Gas Conditioning Plant for export. Lydia who comes from Kutubu in the Southern Highlands joined Oil Search in 2004 with the inaugural batch of apprentices. She opened doors for women when she became the first female to graduate from the programme. After four years as a tradesperson at the Company’s Central Processing Facility (CPF), Lydia secured an AusAid scholarship and went on to study Chemical Engineering at Curtin University in Perth, Western Australia. She graduated with a Diploma in Engineering and returned to Oil Search in 2015. In her current role as a Production Safety Officer, Lydia helps to ensure safe and reliable operations for Oil Search through detailed risk assessments and regular site inspections and tours. This helps ensure safety standards set by the Company are being met by each facility. She is also required to coach and mentor the production team in operational discipline, something she enjoys. Her knowledge on process safety and behaviours has also been invaluable during plant shutdowns and major project construction works. A planned shutdown involves a controlled shutdown of the entire plant or part of the plant for the purpose of planned maintenance on the plant and equipment. Planned maintenance can involve cleaning, repairs, parts changeouts and other basic servicing of the plant and equipment. The objective of the planned maintenance is to make the equipment fully operational and reliable and to increase effectiveness, efficiency and operate safely as per design. The planned maintenance can also extend the equipment’s lifespan. “It has been quite a journey, made even more remarkable on many different levels. I chose this Company because of my dad, Warubi Masahimu. He worked for Chevron and later Oil Search and would fly in and out for work. I wanted to be just like him. Being from the project area, it was a dream of mine to also one day see how oil was extracted from Kutubu and processed for export to the world. Lydia has not taken the opportunity for granted and driven by her deep sense of responsibility, is giving back to her community in more ways than one through working with local women groups and on youth empowerment programs. She also helped set up the Kutubu Disaster Relief Committee volunteer group which provided much assistance to her community during the 2018 earthquake. “Off course, none of this would be possible without the experiences, knowledge including the values and leadership behaviours I gained from my employment with Oil Search. This year I will be celebrating my 15 years of continuous service with the Company. Oil Search has given me the opportunity to work with people from all over the world and it equipped me with the necessary skills to be successful beyond the workplace. “One of my key responsibilities in the Laboratory is quality testing and certification of refinery fuel products such as Jet A-1 to support Oil Search’s aviation and operational requirements. Before the fuel is safe for use in an aircraft, it must be free from water contamination as low temperatures in the upper atmosphere can cause the water to form droplets which can supercool to below 0 degrees Celsius. “If the droplets come into contact with a surface, they can freeze and may result in blocked fuel inlet pipes which might prove fatal,” Grace explains. 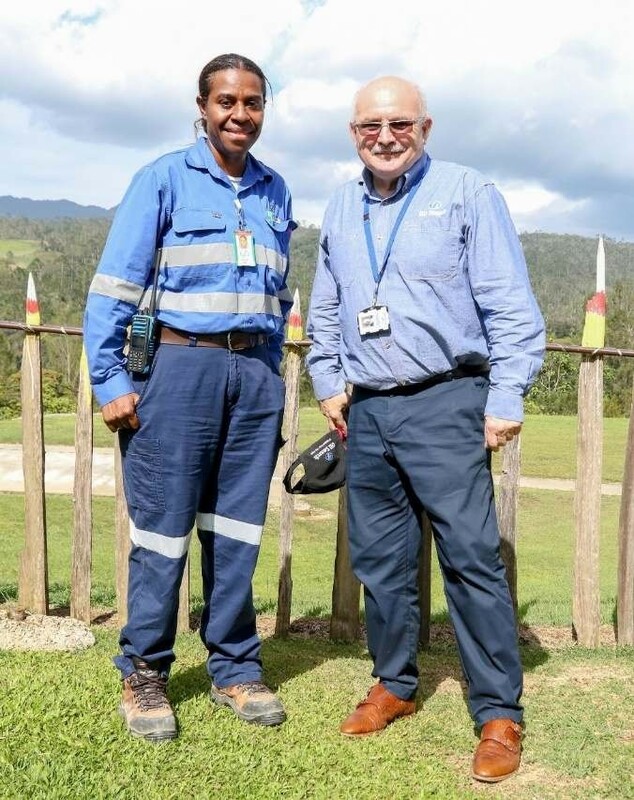 Before Oil Search was able to use its own Jet A-1 fuel for commercial aviation, the fuel had to be certified by the PNG Civil Aviation Safety Authority (CASA). Grace was part of the project team that helped acquire the Licence. The Oil Search Petroleum Laboratory is accredited to ISO-17025 which meets international standards in testing and certification. Data produced here is as precise and accurate as anywhere else in the world. These days, Grace enjoys nothing more than training new chemists. “I have worked alongside the best in the industry for over a decade. I now have the opportunity to impart that knowledge to new chemists or graduates. My advice to young women and girls is to study hard as a career in science is rewarding. Oil Search’s team of petroleum chemists are responsible for the analysis of crude oil and condensate; natural gas sampling and testing; environmental water analysis for regulatory compliance and performance monitoring. They also provide daily analytical support and analysis for the Company’s oil and gas production operations and oversee the safe management of production chemicals used in the operations. Ever since she was a child, Julianne Lamb had a curiosity for discovering the unknown, specifically the Earth and deep time. And this is what she now does as an Exploration Basin Analyst with Oil Search in Sydney. I can see into the past and predict the future. 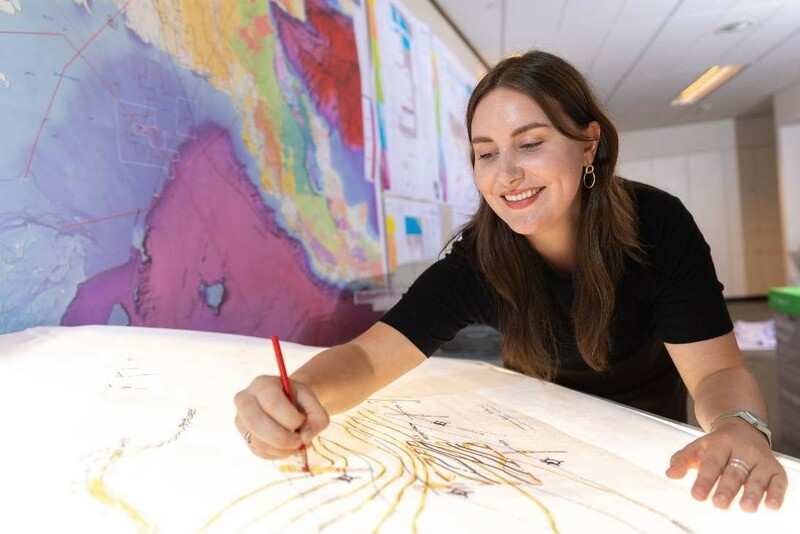 My models, which incorporate multidisciplinary data, help map out the uncharted territory – the history of a basin and where oil and gas may be found,” says Julianne. Julianne has been with Oil Search for two years. “I was a selected speaker at the American Association of Petroleum Geologists (AAPG) Hedberg Research Conference and that is where my door to Oil Search opened. “This is more than just ‘work’ for me, it is a passion,” said Julianne who added there are many gratifying aspects of a career in science: maintaining a constant level of curiosity, investigating and experimenting. PNG describing it as an eye-opener. Port Moresby or Sydney, we all work for a common goal, to find and produce oil and gas. How long have you been with the Company and why did you join Oil Search? Chelsea: I joined Oil Search nearly six years ago, mainly because I believed it was a Company with a strong future that could present me with amazing opportunities. This has turned out to be right! Tell us about the book drive you spearheaded last year? Chelsea: After visiting the village of Sisibia as part of a joint venture field trip, I saw how few books their school library had and decided to ask all my family and local community to donate their pre-loved books. I sent 400 books to Sisibia earlier in the year and another 200 books are currently enroute to Homa Paua. I’d like to collect enough to send through to Baguale and Pimago also, as I visited all four of these villages last year and they are all within our licence footprint. What is the Treasury function’s role? Chelsea: The Treasury discipline is responsible for the identification, measurement and management of financial risks across the Business Units, specifically focusing on funding and liquidity (cash plus available debt), counterparty credit risk, commodity price, interest rate and foreign exchange risks. This covers things like depositing our money wisely to protect our cash balance, minimising our exposure to foreign currencies and interest rates and making sure we deal with companies that won't default on their payments to us. My team ensures that Stephen Gardiner, our Chief Financial Officer, is supported in this area as he manages and drives the bigger picture of all Oil Search’s finances. What challenges lie ahead for you and your team? Chelsea: Oil Search is in a fortunate position – we have strong growth opportunities ahead. A key focus is to make sure we have sufficient liquidity to fund these growth opportunities. Many of our employees may feel pretty far removed from your area of the business and its challenges. How might other roles in the Company impact what you do? Chelsea: In a challenging price environment for oil and gas, it is important that we continue to focus on managing costs to generate more cash and to prioritise and plan our work so that we can deliver the best value from the money we have available to invest . Everyone can help to make our business as efficient as possible. Every dollar/kina does count.